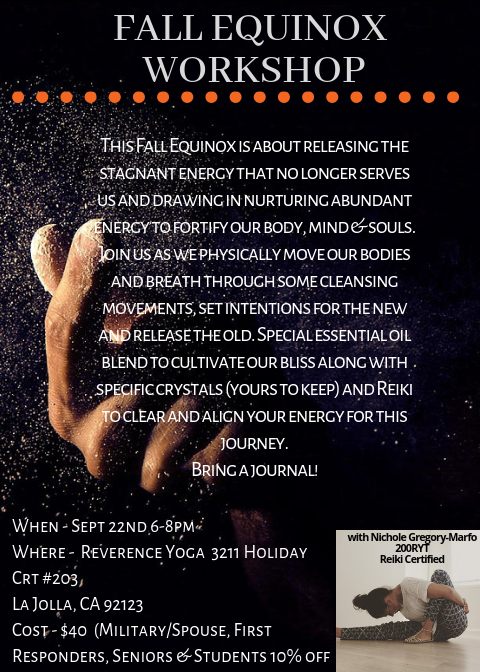 This fall equinox is all about releasing the stagnant energy that no longer serves us and drawing in nurturing and abundant energy to fortify our mind, body & soul. Join us as we physically move our bodies and breath through some cleansing movements, set intentions for the new and release the old. Special essential oil blend to cultivate our bliss along with specific crystals (yours to keep) and Reiki to clear and align your energy for this journey. 10% discount offered to Students/ Seniors/ Military/ First responders and spouses.